Notes: Stories and legends. Astrophytum asterias 'Super Kabuto' with its inimitable fuzzy epidermis is actually the most popular cactus cultivar. It is easily distinguished from the normal A. asterias by the epidermis, that does not have simple dots, but a mosaic of extensive white spots that make the plant look intensely maculate. Superkabuto would (probably) come from a mutation that occurred in nature to just one field-collected individual A. asterias found in 1981 by the Japanese Mr. Masaomi Takeo in an American garden centre and sold to Tony Sato at a high price in Japan. Propagations have been made possible by cross-pollinating this fist plant with other normal A. asterias and A. capricorne (and possible other Astrophytum species too), it can be concluded that all the SK actually available are the result of intraspecific hybridization and SK contains not only A. asterias genes but also a significant number of A. capricorne genes, and maybe others. 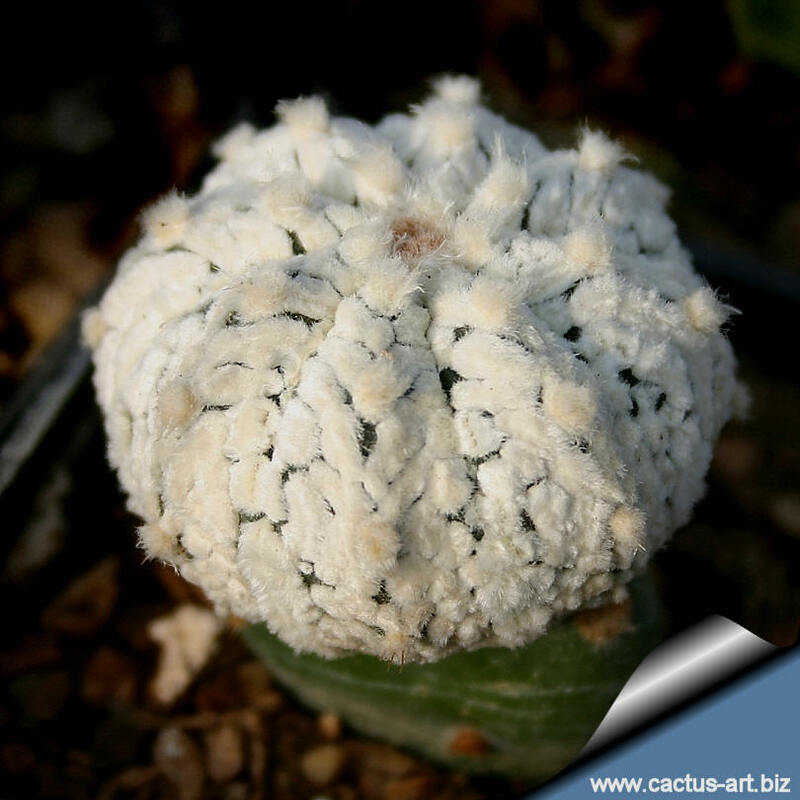 As a result spiny clones appear rather often and the name Astrophytum asterias cv. Super Kabuto is not quite correct. Remarks: Many different beautiful forms of 'Super Kabuto' , which differ for the diverse pattern of the spots are now available. It would be difficult to mention them all: they range from completely white forms ('white-type'), to forms with woolly spots ('snow-type'), to forms with a maculation like the shape of fly's wings ('zebra-type' or 'V type'). Be careful: The epidermis of Superkabuto is harder than in the normal asterias and cracks easily if plants are overwatered. A. asterias cv. KIKKO "nudum"
A. asterias cv. KIKKO "nudum albinum"
A. asterias cv. OOIBO RURI (nudum) KABUTO. A. asterias cv. SUPERKABUTO "5 ribs"
A. asterias cv. SUPERKABUTO "cristata"
A. asterias cv. SUPERKABUTO "Snow type"
A. asterias cv. SUPERKABUTO "Star type"